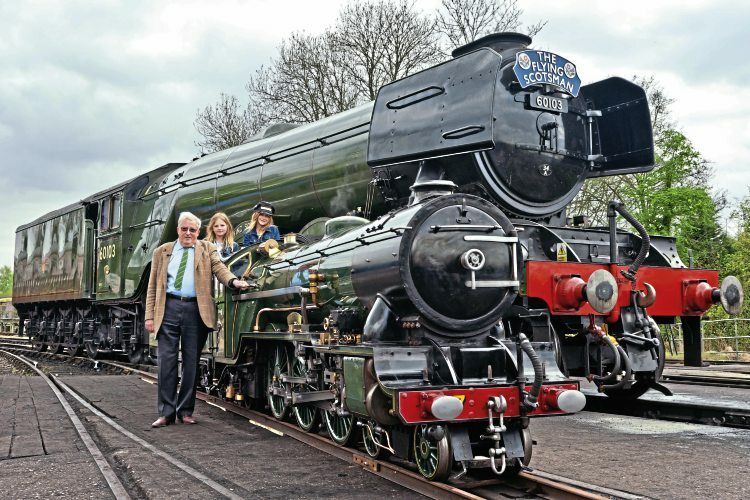 IN RAILWAY heritage terms, giant is too small a word to describe Sir William McAlpine. The man was quite simply a colossus. Described variously as ‘Britain’s greatest railway enthusiast’, ‘Preservation’s best friend’ and ‘Champion of the heritage sector’, he bestrode the world of steam in a way no-one else is ever likely to again. Perhaps best known as the millionaire who rescued Flying Scotsman from America in 1973, his contribution to the British heritage scene encompassed far, far more than that. Indeed, it seemed at times as though there wasn’t a railway society in the country that didn’t have his name on its letterhead as chairman, president, trustee or patron, so strong was his desire to support the guardians of transport history. Everything Bill did was larger than life. Not content with merely owning the planet’s most famous locomotive, he shipped ‘Scotsman’ all the way to Australia, where it set a world record for non-stop running. In the grounds of his estate in the Thames Valley, he built the biggest and best private railway in the land – a standard-gauge line featuring Britain’s steepest adhesion-worked incline – while the transport museum he established was stocked with so many precious exhibits visitors often described it as second only to the National Railway Museum. Sir William was the heritage world’s ‘A-List celebrity’ and his death on March 4 at the age of 82 has robbed the movement of its greatest ally and benefactor. Born on January 12, 1936, William Hepburn McAlpine had steam in his blood from the very beginning, for he was the great grandson of Sir Robert McAlpine, the famous Victorian railway builder known as ‘Concrete Bob’. Early childhood was spent in Nutfield, Surrey, and his earliest memories are of trains on the ex-South Eastern & Chatham line from Redhill to Tonbridge. When he was five, his father, Lord McAlpine of Moffat, took him to one of his construction sites near Reading and let him ride in a 2ft-gauge Simplex loco, but the rail interest then lay largely dormant until Bill met a fellow pupil at Charterhouse School by the name of Christopher Walford. It was a McAlpine tradition to leave school at 16 and join the family firm, so in 1952 William began working at the company’s main plant depot in Hayes, Middlesex, a site that not only possessed an engine shed, but was located alongside the Paddington main line.